"Frank Robinson and I were more than baseball buddies. We were friends. Frank was a hard-nosed baseball player who did things on the field that people said could never be done," Aaron posted on Twitter. "Baseball will miss a tremendous human being," he said. 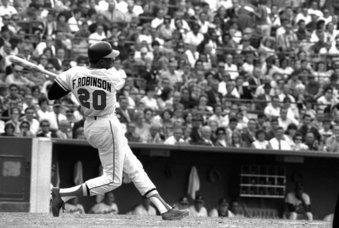 An All-Star outfielder in 12 seasons and a first-ballot selection to Cooperstown, Robinson also was a Rookie of the Year, a Gold Glove outfielder and a bruising runner. But his place in the sport's history extended far beyond the batter's box and basepaths. The Reds, Orioles and Indians have retired his No. 20 and honored him with statues at their stadiums.Robinson later managed San Francisco, Baltimore and Montreal. He became the first manager of the Washington Nationals after the franchise moved from Montreal for the 2005 season — the Nationals put him in their Ring of Honor. "He had a huge influence on me when I first came up in '63," Rose told The Associated Press by phone. "Frank was a really aggressive, hard-nosed player, and it rubbed off on everybody. Frank was the one who took me under his wings, so to speak...Frank consistently talked to me about playing the game the right way," he said. At the time, the Orioles had a batboy named Jay Mazzone, whose hands were amputated when he was 2 after a burning accident. Mazzone capably did his job for years with metal hooks and became good friends with Robinson. Some players, though, initially weren't sure how to treat the teen.